Stories Like These and Griffin Independent present the World Premiere of MINUSONESISTER, by Anna Barnes, at the Stables SBW Theatre, Kings Cross, 9 September - 3 October. MINUSONESISTER is the Sydney Theatre Company's (STC) Patrick White Playwright's Award of 2013, by Anna Barnes. 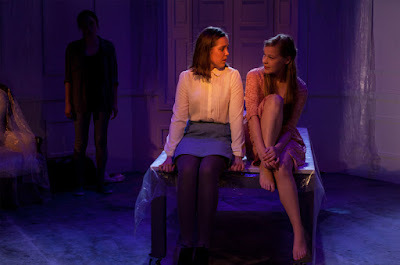 The action of the play is set in a contemporary, salubrious household of an Australian city, with a set of siblings - three sisters and brother - struggling, inside a wrapped crime scene room, to make sense of the consequences of terrible family/domestic violence, that has escalated into a series of bloody revenge murders. A socially-culturally apt reflection of concerns of one of our present real world dilemmas - check out your news outlets. So, in MINUSONESISTER, translated into the present time, two sisters (of a Greek family, I presume), Electra (Kate Cheel), Chrysothemis (Contessa Treffone), and their younger brother, Orestes (Liam Nunan), moving backwards and forwards in time, conjure a murdered sibling, Iphigenia (Lucy Heffernan), and recall and re-enact, for us all, the circumstances of the origins, and details of the consequences of domestic murder(s). This is a very successful 'time-machined' work by Ms Barnes and its logical extrapolations of the original have been carefully thought through into the ethics and law of our present world - unlike the Alberts/Sarks collaboration. Too, the focus on children/adolescents of this modern world, convincingly dressed in our present world costumes, command a belief veracity and, perhaps, a ghoulish gazing of some tentative fascination. The production values, the Design, by Georgia Hopkins; the Lighting, by Sian James-Holland; and a dense (though, sometimes overwrought) Composition and Sound Design, by Nate Edmondson, are of a very high quality - elegant and dramatic. The actors have been drilled into an empathetic ensemble of play, for the play, by Director, Luke Rogers, with challenging and complicated verbal feats with the language demands of Ms Barnes' writing, made choral in affect; and who are, also, required to be both the characters when in the subjective re-enactments of certain elements of the story, and, largely, the objective narrators/storytellers in the present time, in the theatre. The principle problem, for me, was that the actors never really seemed to be in any 'awe/state' of having ever experienced the events of the play in, either, the traumatic present in their recall, or, even more surprisingly, in the re-enactment sequences. They were, mostly, actors, impersonating objective storytellers with no apparent embodied memories of what Electra, Chrysothemis, Orestes or Iphigenia had seen, heard, smelt or did in this modern-day domestic tragedy. There were no personalised 'trauma' stakes from the story apparent in any of the acting - the closest being a generalised, remote intellectual comprehension of it all, but with no realised truths on view, nothing for the audience 'to read', of survivors of such domestic tragedies. And, however effective the acting in the production maybe, and it is effective, with certain manifestations of the acting craft, it never convinces beyond that they are anything but actors telling a story. On top of that, the company tended to shout the work, and within the flanked walls of the design, the consequent noise levels, in this small theatre space, caused a necessary 'pull-away' from the actors' efforts. One was forced to sit out of the play, unable, to 'lean' in to it, for fear of 'injury', to permit us to easily empathise, at any inclusive level, with anything much happening on the stage. We could not attach to the momentous subject matter of the journey of the characters in the play. Stories Like These have taken up the 'thrown chalice' challenge of presenting this prize-winning and impressive play by Ms Barnes. One is grateful to the company for their deliberate engagement in contemporary writing, with an emphasis on new Australian work, and especially in presenting MINUSONESISTER. It is odd, is it not? Curious? One would think the STC would/should have some responsibility after awarding the playwright that they then present the work, from off the page to the stage. If for no other reason than to justify their prize-giving, and to promote Australian artists? And one can, further, beg the question, why the Literary Advisor at Belvoir didn't advise their artists that there was a significant prize winning play, not yet produced dealing with a contemporary telling of the Electra/Orestes myth. An actual play in a prize winning form, all ready to go! Really, odd, considering the unready nature and poor 'showing' of their ELEKTRA/ORESTES offer. Mr Rogers' production could, unequivocally , with certain adjustments (particularly, say, of volume), reveal a very interesting Australian female voice of the theatre. Jane Bodie at the Eternity with RIDE and FOURPLAY, and Anna Barnes at the SBW Stables, making good impressions for audiences to absorb.